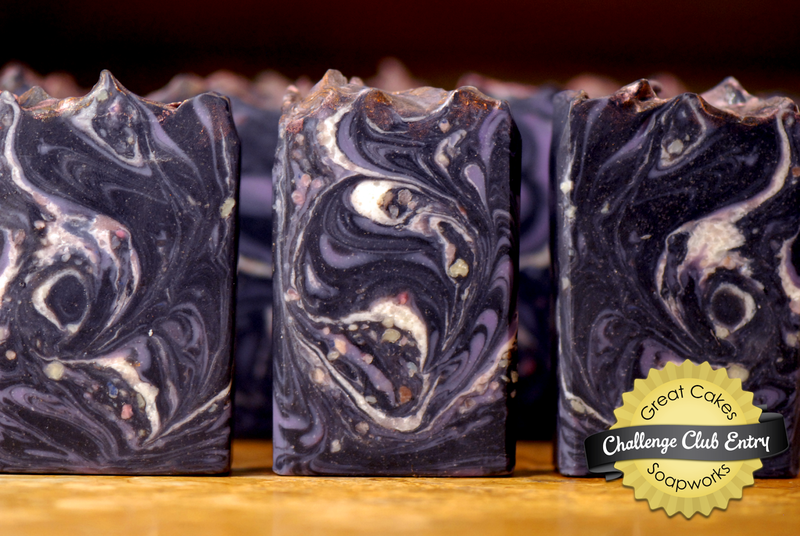 Another soap challenge, and another awesome technique to learn! I was skeptical of this one, as I thought it was the lowly spoon-plop. But no, it's the spoon swirl, which turns out to be very useful! As soon as I saw Amy's video, I knew exactly what I wanted to make. If you've seen any of my previous posts, you know I'm a bit obsessed with trying to make things like clouds and outer space in soap. Well, now I've seen how to make clouds, so time for space! The trick for space seemed to be to embrace the speckles, which isn't easy for a soap maker, as we usually try to avoid them. I also wanted to experiment with layering several different textures, and then swirling them together in place. First, I dug out some old pastel-hued soaps and grated about 1/4 cup. To make them more planetoid, I rubbed the gratings back and forth in my hands to knock off the edges. I then sifted out the tiny dusty bits and put those aside. 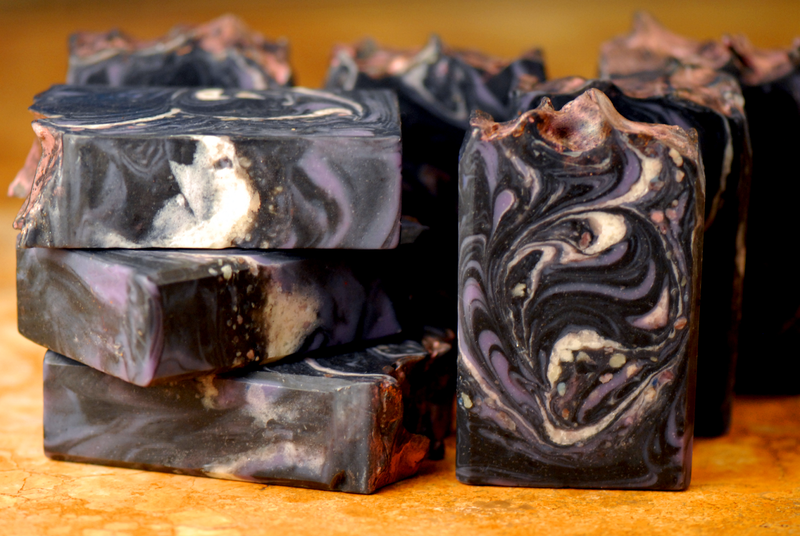 For the main soap, I made up equal amounts of black (1 T charcoal ppo) and purple (Soapberry purple with a touch of charcoal) and several ounces of off-white (TD). Into the dark colors, I mixed the dusty pastel bits, to mimic the look of open space. 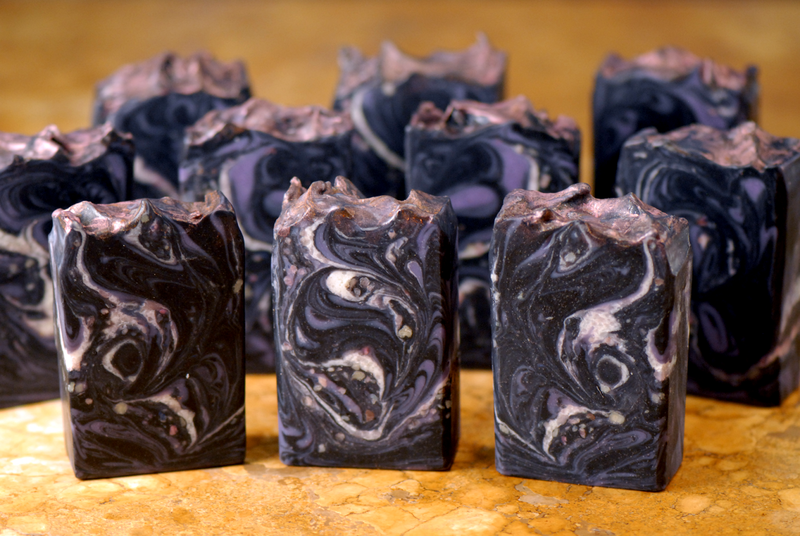 I then combined the purple and black in an in-the-pot swirl at medium-thick trace, and poured half of that into my tall and skinny loaf mold. On top of that, I sprinkled half the rounded gratings, to mimic planets, then added a thin layer of white for the milky way. On top of that, more planets, followed by the rest of the black and purple. I swirled the whole loaf using a large soup spoon over two passes, and finished the tops with purple and copper mica. I'm very happy with the result -- they look so cool! First nebulas, now this!! I LOVE it!! The planetoids really make the whole thing pop and look like outer space! The in-the-pot swirls also give it that spacey feel. Your soap looks amazing! Beautiful design! This is really awesome, I love your concept! LOVE what you did, here! Wow! Great concept beautifully executed. Very nice. This is SO COOL! I bet you had a blast figuring this one out, and such great results must make you feel quite accomplished! Seriously awesome. Such an original idea! My ITP turn out completely ordinary, but this is splendind! Congrats!! On top of that...they are amazing! These are "out of this world" cool! I couldn't help myself... 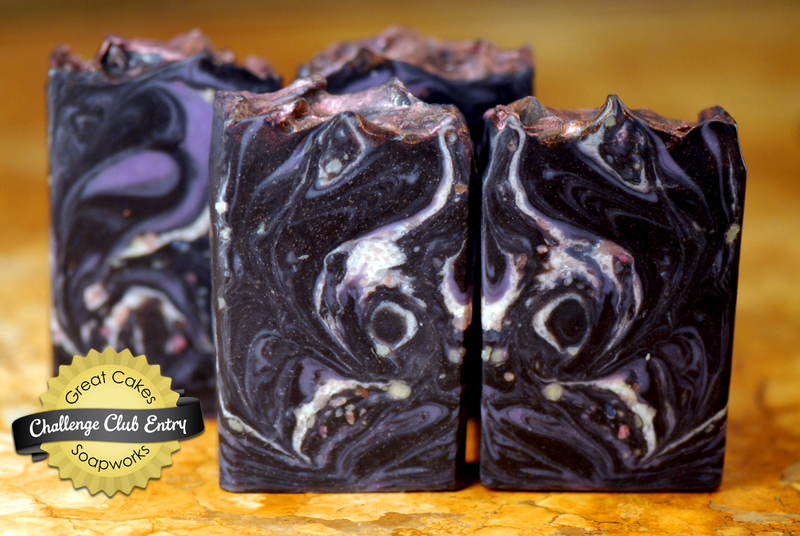 Awesome looking soap bars!